Tenet. We believe in God and are women of faith. Tenet 1. We believe in God and are women of faith. As Big Ocean women, we value our identities as women of faith. We represent 83% of women who identify with a faith tradition. This figure is considerably higher in women than in men, which might suggest that many of us are intrinsically connected with religion and naturally experience the world through a faith-filled lens. Of the many women of the world who carry children, families, communities, and nations upon their shoulders– and with such strength, courage, and grace– it can be said that they are each women of faith. The language of faith is intuitive to women. It’s how we communicate and lift each other up. The faith-filled and religious voice is our voice. It is imperative then, that as women, we advocate for our freedom to live and worship as we see fit. Not only within the walls of our homes, but also in the public square. The freedom of conscience is inseparably connected to many other freedoms that will improve the lives of women, their families, and communities. Therefore, we must organize, speak up, and lead out on this critical social issue. Our faith and connection to a higher power indeed fuels us with the desire to engage in and improve the world around us. As we use faith to navigate the shifting moral trends of our day, we feel a deep sense of optimism and confidence. With a mindset of abundance, unity, and purpose, we are inspired to positively impact our external surroundings. Our bedrock of faith is directly connected to our sense of resilience. As we first look to heaven for guidance, we then firmly position our feet and steadfastly move forward with clear direction and determination. When we recognize and trust in a power higher than ourselves, we are open to receiving guidance and help no matter how difficult the road ahead may seem. While Big Ocean Women supports on-the-ground advocacy and humanitarian efforts, we want to shine the light of our faith into the darkest of places – places that we may not be able to immediately reach through any other means but the power of our prayers and faith. We want to send our love and light to those suffering as a result of child and human trafficking, gender-based violence, and women, children, and families in war zones. We invite concerned women of faith everywhere to join with us in prayer for those suffering from these atrocities. 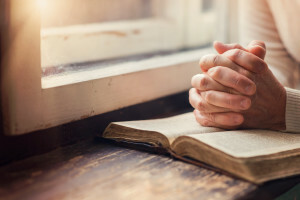 We believe prayer is a doorway to a profound connection to God. Prayer in its many forms and expressions is as much an outward as an inward one. By focusing our thoughts, intents, and desires on those around us as well as our larger global family, we will find inspired ways to support one another. You may choose to pray and fast together as cottages, celebrate holy days together, read from sacred texts together, or meet together in your holy places of worship. Faith extends beyond a thought or a wish, however. It is a principle of action. Across nearly every faith tradition, one pervasive theme that exemplifies a devoted religious observer is when she willingly gives of her talents, goods, and time in the service of others in need. In Big Ocean cottages, we are not only a group of women that come together for philosophical discussions and political understanding, we are also a collective of women who take positive actions to serve within our homes, neighborhoods, and our global family. As we access our collective faith, we will be led to generate creative solutions and offer significant help. How has your faith anchored you amidst life’s challenges? How can you share your thoughts and beliefs in a way that will uplift your community? What are actions you and your cottage can take to become more aware and well versed in religious freedom issues? What are the things that you can do every day that will strengthen your faith in a higher power? 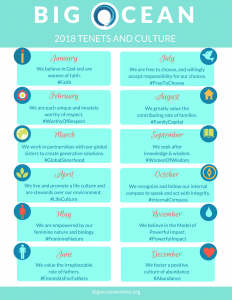 How can you connect with women from other faith traditions? How can you come together to strengthen and support your community? You are a woman of light, how can you share that light with others?